Fashion dolls are introduced to unsuspecting Greek public! Last Monday, a major Greek newspaper published an article about my doll collection. The reporter found my blog on-line, liked it and asked me if I would be interested in doing a small interview for the collection, with photos of my dolls included. They also wanted one photo of me with some of my dolls. I promptly said yes, answered the questions that were sent by e-mail to me, and organised a small photo shoot in a seaside village. I wanted to have a new photo of me included with the interview, and if possible in a summer setting. By Saturday night I had sent all the material needed. The article was published in the Greece section of the paper on the 21st of July. I think it is the first time fashion dolls are mentioned in print in Greece. The only relative article I remember is one about dolls depicting famous persons - that mainly concentrated in dolls like Mattel's Elvis, Sinatra and Marilyn. The article as printed in the actual newspaper. "I am an Olivia Newton-John fan and found on-line a doll representing her as Sandy from the movie Grease. Of course I ordered her. When I received her, I knew I could not stop at one!" 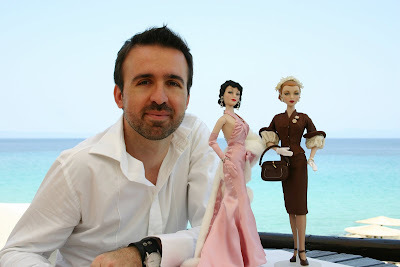 says to TA NEA (The News-the newspaper's name) Mr. Stratos Bacalis, fashion doll collector. The 39 year old collector works as a designer and engineer in an architectural firm in Thessaloniki. He studied fashion design and civil engineering. But, as he claims, "I never got my degree as a civil engineer since design won me over completely because it was such a fascinating world". His love for style and fashion found an ideal expression in 2000 when he discovered that Sandy doll on the Internet. This photograph was used in the contents section of the paper, page 2. So a special hobby began, that today translates to approximately 100 fashion dolls. It's about dolls that can be from the well known to most of us Barbies, but in collector's editions, to pieces that represent historical persons or famous actors in roles that became legendary such as Vivien Leigh as Scarlett O'Hara in the film Gone With The Wind. In fact some are creations of well known fashion designers such as Versace. His passion is such that for every piece in his collection, he knows almost everything related to it, from manufacturing details to the history of the person represented. One of the unused photographs . Mattel's Queen Elisabeth the 1st. As for the one he always wanted to have: "Queen Elisabeth the first from Mattel. It was a limited edition and expensive. I like the Tudor era very much. So when Mattel put the doll on a very attractive offer, I could not resist..." he notes. Of course his wishes do not end there. As he admits, he would love to have quite a lot of dolls. "I wish I had the money to buy them all, even though then I would have to leave the house due to lack of space! I would like to obtain Elisabeth Taylor as Cleopatra, but she is expensive and hard to find as she has been discontinued. Maybe one day..." he characteristically says. These dolls are not sold widely in Europe as the shops importing them are few and mostly on-line. So if someone wants to buy one of them, he has to turn mainly to US on-line shops. Of course, as Mr. Bacalis points out " you need a lot of research to find the best place to buy one, as well as perseverance and patience". He adds that "one can find some real bargains and also make a research into relative forums and groups of people with the same hobby". Also of use are the manufacturers web sites for information about new releases. Prices depend on many factors. Manufacturer, quality, doll and edition size are the most important. "A simple Barbie Collector's edition can start from US$25. While for a unique doll one can give many thousands of dollars. It is always a matter of supply and demand as with every collectible" he mentions. There are some dolls that have been produced in One Of A Kind editions. Most of them are auctioned for charity purposes so their price can reach astronomical heights. For example, in 2006, a Barbie In Midnight Red was auctioned in London for US$17,000. Olivia Newton-John as Sandy in Grease. "The "Ghost of Christmas Future" doll from the Dickens' story "A Christmas Tale" is one of the many in my collection that I particularly like" says to "NEA" collector Mr. Stratos Bacalis. Audrey Hepburn with the black dress in "Breakfast At Tiffany's"
The box in the centre of the article has a top-5 of fashion dolls. Fashion Royalty dolls, designed by a real fashion designer, Jason Wu. Sybarite dolls from the UK. The Tonner Doll company dolls. Mel Odom's Gene Marshall and Madra Lord dolls from Integrity. I found the article generally good, the reporter made a nice text from the answers I send but she did not mention my blog even once! And the strange thing is she found me from the blog!!! Go figure. That omission not withstanding, everything else was great. And I got the chance to make fashion dolls known to a large section of the public here with a serious article.